Recently, someone asked me if I kept a journal. When I answered that I actually keep multiple journals, they seemed a bit surprised and said that they just didn’t think they could build the habit to journal. So I thought it might be useful to write up a post on how I journal, perhaps to encourage others and show that while it’s tough to build the habit, it doesn’t have to be complicated. I started journaling a little over two years ago when my dad gave me a journaling set he had put together for my birthday. He gave me a Lamy Safari, a stack of carefully chosen, fountain pen friendly composition notebooks, and a personalized leather cover for the notebooks. Since then, I’ve journaled nearly every day. And these days, I actually keep two journals: one for me, and one for my daughter. 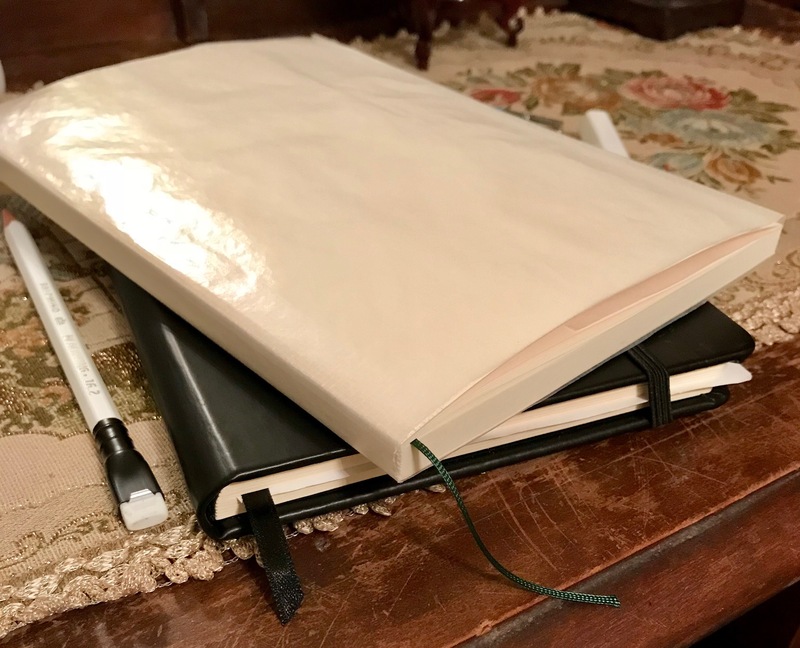 When I started writing this post, I was keeping my personal journal in a Kokuyo Campus B5 Notebook, and I had trimmed the edges of the cover slightly to make it fit in the composition notebook cover that my dad got me. However, I finished the Campus right before our Christmas travels and I wanted to switch to something that’s a little bit more portable, so I’m using a lined Midori A5 for the time being. I’m not quite sure I like the smaller format, but it’ll do for now. In my personal journal, I simply write whatever comes to mind when I sit down to journal in the evenings. I don’t have a defined entry length or anything, and I don’t use any prompts for my entries. Sometimes I write about what happened that day, other times it’s a topic that’s been bouncing around in my head throughout the day. No matter what, though, I try to sit down and get at least a few paragraphs in this notebook every day. The other journal is for my daughter, and it’s a little different. For her journal, I’m currently using a Rhodia Webnotebook in A5, mostly because I wanted something with a hard cover. In that book, I write her a short, letter-style entry about what happened to her that day. It’s a twofold benefit: maybe she’ll look back at it someday and have something fun to read through, and it helps me remember her little milestones. That second bit is particularly helpful for a sleep deprived set of parents. I decided to start this journal simply because everyone always says “you’ll forget all about the stuff right after she’s born,” and I didn’t want that! Writing instrument wise, I tend to use whatever I want when I sit down to write in my personal notebook. Sometimes that’s a fountain pen, and sometimes it’s a pencil. Since my personal journal is just that, personal, I’m not worried about longevity or anything like that. In my daughter’s journal, I only use fountain pens. I did think for a while on whether I wanted to also use waterproof or archival quality inks, but in the end, I decided to keep it simple and just use whatever is inked up at the moment. And at the moment, that’s it. It’s not particularly complicated, and I try to keep it that way. I’ve found that the best way to make sure that I stick with journaling is to keep it simple and write what comes to mind. But that’s just my process. Hopefully it inspires someone else to get started in the new year!